Hordes of gay and bi-curious men scan the city with mobile apps in the ever-appealing quest for a date, a hookup, or a husband. That's hardly news, but what are the most fruitful and time-efficient neighborhoods? 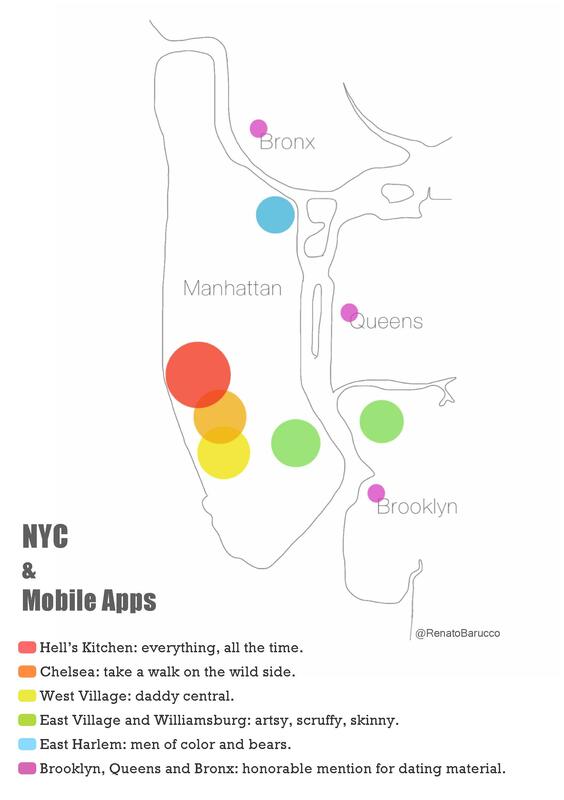 I spoke to 50 men who use location-based mobile apps all over the city. According to them, these are the five neighborhoods to geo-socially explore when urges arise. 5. East Harlem: It's the realm of statuesque black guys, Latinos muy guapos, and beefy beauty bears. The neighborhood offers diversity, unpretentious vibes and a laid-back atmosphere. "In Spanish Harlem there's a black and Latino population I don't get to meet that often," says Frank, who works in Midtown. D., who lives in the area, also opts for East Harlem: "It feels like it's chill up here." The downside? The location is a trek for gay men living downtown or in Brooklyn. 4. The East Village and Williamsburg ex aequo: These two neighborhoods are almost always mentioned simultaneously; the umbilical cord that historically connects the über-gentrified East Village with super-gentrified Williamsburg pulverizes geographical distances. Additionally, it seems that boys who live in Williamsburg play in the East Village. From extreme hipsters to genderqueer protesters, scruffy skaters to alternative artists of some sort, they are cute, and they elude the rest of Manhattan. If you want grunge gays, log on no further. Note: Boys tend to be skinnier in these necks of the woods. 3. Greenwich Village: The Vill still has it. Ballroom kids stroll on Christopher Street from the Path Station to the Pier -- although many cannot afford smartphones unless they pull tricks. The Stonewall Inn has its nights of pure fun. Few gay folks have the means to live here, though. Those who can are normally older. "I like [to log on to apps in] the West Village because a lot of attractive daddy types are there," says Matt from Long Island. 2. Chelsea: This neighborhood may no longer be New York City's gay wonderland, but it still hosts the most pampered, groomed and muscular gay men. Circuit boys, gear collectors, and rich power gays inhabit the expensive walls of what is slowly but surely becoming SoHKi: South of Hell's Kitchen. Chelsea wins the trophy for the neighborhood with the kinkiest and wildest characters. "I mean, Chelsea has the hottest guys, and they are always ready," says Jay, who commutes from Midtown West. Always ready but "often flaky," adds Mark from DUMBO. 1. Hell's Kitchen: As Stefon from SNL would put it, this neighborhood has everything: twinks, otters, lost tourists, businessmen at the W, Brazilian ambassadors. Hell's Kitchen, formerly known as Chelsea Heights, wins on quantity, with its wealth of gay bars and residents. "It's a busy neighborhood with lots of gay men," says James from Astoria. "My taste varies, and there seems to be a lot of guys who live/work/socialize there." Dan from the Upper West Side agrees: "Hell's Kitchen has the most options these days. And those guys are on their apps all the time." A little suggestion: If you don't have much time, log on to your app from the Eighth Avenue subway lines while going through Times Square. Brooklyn, Bronx and Queens were honorably mentioned for hosting dating material. Alas, no trace of Staten Island. Keep your devices handy. Each neighborhood has its flavors and, quite surely, plenty of valuable exceptions to alleged norms.